For those who have not had a chance to read The Wars of Reading (I’ll pause and let you read that magnificent book... Yes, I’m still waiting…I was released exactly four years ago…Yes, Ben, it has been that long… You’re finally up to speed? Good. ), The Society operates in a different organizational structure based upon the Un, Trey, and Sept. For this army, I’m only worried about mechs so it boils down to an Un being one mech and three Uns make a Trey. So I’m looking at three mechs to hide in this nova. The Cephalus Prime is just not going to cut it for me. The lack of damage in such a small force is going to be a hindrance. If I could rotate the NOVA between pairings each turn, it could be effective but not in its current rules iteration. (I think changing it to the way it is in TW would greatly help the poor Cephalus Prime but it would just make NOVA overpowered. That is an entirely different matter.) I mentioned that I have an Osteon Prime so that is a nice start. It is a nice Juggernaut that is a whopping 75 points. I prefer the D configuration but I have a Prime ready to paint and the iATMs are calling my name. Continuing on with my unholy fascination with iATMs, I have a couple options for the Osteon’s Society friends. I like the evilness of the Turkina Z but I want to keep my forces a little more mobile than that. I would prefer to stick with the Battle Star formation and it would be nice to have four units that meet the Battle Star’s requirements to help reduce the odds of the ability going away with the loss of a single mech. In addition, I’m trying to make for some easy conversions. The Timber Wolf Z is a simple one. It has good speed and decent long ranged firepower. In addition, it is a Skirmisher of size 3 to fill out our Battle Star’s requirements. That leaves me with one more NOVA unit to find. I added NOVA to the MUL as an AS Ability to search. I’m bouncing between the Summoner Z and the Stormcrow Z. They are similar units. The difference being jump jets and one point more of long range versus faster ground speed without jump jets and higher short and medium ranged damage. The Stormcrow also comes with a higher price tag. They are both Skirmishers so they both work for the requirements although one is a size 3 and the other is a size 2. The Summoner is going to win out for me in this round. I’ve always liked the looks of the Summoner and enjoy working on the mini. The Stormcrow is hurt by the fact that I just finished painting two of them recently. It has been a while since I’ve done a Summoner so it gets the nod. So where does that leave us? We have three Society mechs hiding in Coyote skins. 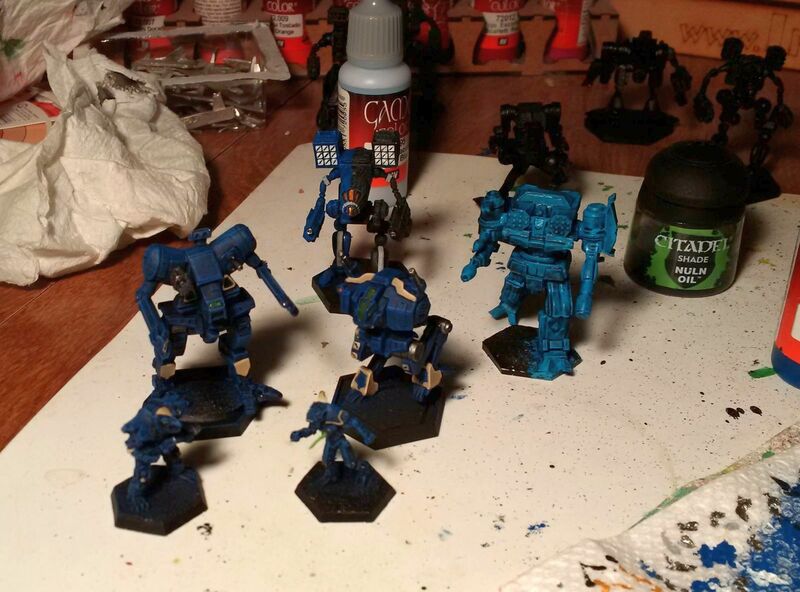 I mentioned that I had a Septicemia D already painted that I’m building this army around. That one is also a Skirmisher but it is only a size 2. This just helps reinforce my decision to pick the Summoner over the Stormcrow. I know it will be a nova so I’ll have five battle armor units being added. From our experiment with Zeta, I know we are looking at no more than 90 points. Most battle armor seems to be in the 15 point range for a squad of five. So we have 226 points in mechs with another 75 to 90 points in battle armor. I’ve got anywhere from 44 points to 99 points. Remember that Executioner E that I was eyeing up for Zeta. It sits nicely at 55 points and works nicely for a Battle Star being a fourth Skirmisher and fourth unit of size 3 or higher. With our mech forces complete, let look at what we have. We have three mechs with NOVA that will feed off of each others’ targeting data and all have at least decent long range damage and good medium ranged damage. Most move 10 inches with the Osteon being the only slow one at 6 inches. Three of them have jump jets. The Summoner and Septicemia are the light weights in the armor department but still able to soak up 6 points of damage before going internal. Let’s take a look at our battle armor options. They will need to have the MEC special ability. Looking at the MUL for Clan Coyote in the Jihad, I spy a couple of options. I can use tried and true Elementals, Coronas, Gnomes, or Salamanders. I have 79 to 119 points with which to work. The most expensive of my options are the AP Gauss elementals at 20 points each. I don’t think I have to worry about going over. They all have MEC so we are good there. Let’s look at what we can get for our points. All of my choices have two points of structure. Coronas and Salamanders only have one point of armor. Elementals and Gnomes have two points of armor. Coronas and Gnomes have higher damage. They each do 3 points of damage out to medium range. They are also both slow at four inches of movement. I’m going to cross the Salamanders off the list as they are currently archived. The slow speed of the Coronas coupled with their single point of armor, even if they are good value for their stats, just isn’t for me. That leaves me with Gnomes and Elementals. So my choices are big beat stick and a more flexible suit of armor with nostalgia value. For the Gnomes, Clan Coyote has access to just the standard version. They do 3 damage out to medium range and have 2 points of armor. They are slow. They say fire power, staying power, and speed; select two. Gnomes skipped on the speed. They still have jump jets but they do not have any anti-mech capabilities. We will be using them solely for the damage output. I grab two of them at 15 PV each. That leaves the classic Elementals. There are effectively three varieties: AP Gauss, flamer, and everything else. Well that isn’t entirely true. Clan Jade Falcons have their fire resistant models. There is also a space version that lacks the SRMs thus losing a lot of their damage. I’ll stick with the classic suit and its various weapon configurations. The plain basic versions (MG, HMG, ER Micro Laser, Laser, and Micro Pulse Laser) are all the same. Six inch move with jump jets, mechanized, anti-mech damage, with 2 points of short ranged and 1 point of medium ranged damage. The flamer version is the same but add 1 point of heat damage at short range. The AP Gauss version forgoes the heat for a second point of medium ranged damage. I would like to have the heat special ability handy so I’ll take two of them and for the final point of battle armor, I’ll opt for the AP Gauss. The extra damage could be handy. This leaves us with a final army consisting of a Septicemia D, Summoner Z, Timber Wolf Z, Osteon Prime, Executioner E, 2 Gnome Battle Armors (Standard), 2 Elemental Battle Armors (Flamer), and an Elemental Battle Armor. It comes to 363 points. The mechs form a Battle Star with the modified Lucky SPA. That will be it for now. I need to go finish my order for IWM so I can start assembling and painting.